Perfect for your PC speed boost! NOTE: Package comes with "2.5" to 3.5" conversation mounting bracket" for this drive install into desktop 3.5" hard drive bay. Not require on some servers. Engineered for maximum speed! White Label 250GB 2.5" 10K RPM 16MB Buffer SATA2 hard drive, the newest member of our unique class of 10,000 RPM SATA hard drives, combines a SATA 3 Gb/s interface and 16MB cache to deliver performance that's up to 35% faster than its speedy older brother. Killer speed - Built on the performance bloodlines of these 10,000 RPM drives, with SATA 3 Gb/s interface, and 16 MB cache deliver mind-bending performance. Not only are they 35% faster than the previous generation Raptor drives, but they also beat out all other competitors in the field. Double the capacity - State-of-the-art technology packs twice the capacity per disk resulting in up to 250GB of ULTRA-performance storage space in this enterprise-class 2.5-inch drive. 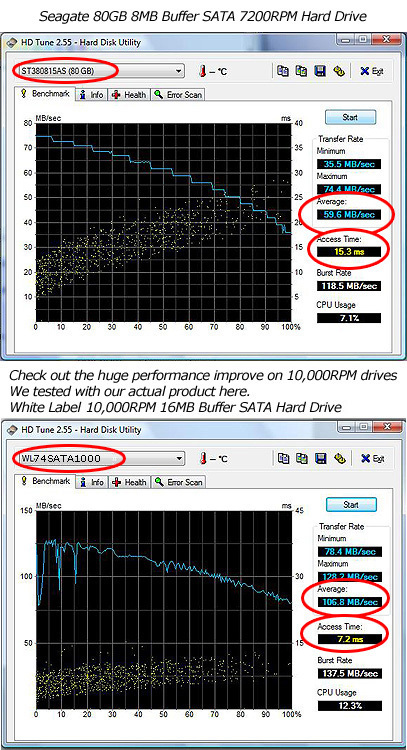 Ultra-cool operation - This 2.5" 10K RPM SATA Hard Drive consumes 35% less power than the previous generation of WD Raptor. Rotary Acceleration Feed Forward - Optimizes operation and performance when the drives are used in vibration-prone, multi-drive chassis. A white label product is a product produced by major hard drive company that manufactured for other companies (OEM Hard Drive Reseller) rebrand to make it appear as if they made it or for large volume special application.